Made of an unusual lustrous gray metal, tungsten wedding rings are becoming popular choices for men. The metal's strength, durability, and affordability make it an excellent option for active couples who want a distinctive style to symbolize their relationship. Tungsten is a pure element that can be forged into incredibly strong and durable alloys, typically including carbon (tungsten carbide alloys), and then combined with nickel to create stunning rings. While pure tungsten is still prone to scratches and other damage similar to other metals, tungsten carbide is four times harder than titanium and nearly ten times harder than eighteen-karat gold, making it the hardest metal used for commercial jewelry. This makes tungsten wedding rings particularly desirable for anyone who is involved with physical activities that might scratch, nick, or damage softer metals. Because of tungsten's strength, the polish is often considered permanent and will not wear off even after many years. Precious metal inlays of silver, platinum, or mokume gane for contrasting colors and vivid accents. Symmetrical grooves or bevels to create patterns or carvings around the band. Different levels of polish for a highly reflective, semi-glossy, or matte finish. Inset diamonds or gems to add sparkle, usually in protected flush or bezel settings. Rounded, square, or ridged edges for a simple yet sophisticated pattern. Different alloy proportions to create a ring color anywhere from dark to light gray. 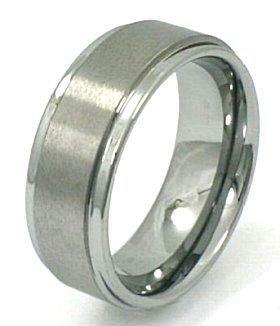 With such a variety of designs available, it is easy to find the perfect tungsten ring for any groom-to-be. As with any jewelry, consumers should be aware of potential problems with their purchase. When investigating tungsten wedding rings, couples should note that pure tungsten isn't nearly as strong as alloys, and nickel is the preferred metal to combine with tungsten carbide because of its strength. Cobalt is occasionally used as well, but it can bond with the oils in skin and cause permanent tarnish to the ring. Because of the strength of tungsten rings, they are more brittle than other metals and are likely to chip or fracture rather than bend or deform when exposed to percussive blows. Furthermore, because tungsten resists scratching, it cannot be engraved effectively if a couple was considering that type of customization. Tungsten wedding bands cannot be resized by conventional means, and if resizing or other repairs are necessary, the ring will usually need to be returned to the original merchant. Most jewelers do not routinely offer tungsten rings, and the best place to find a wide selection is through online merchants. Before completing a purchase, however, the couple should investigate the reputation of the business through customer testimonials, published customer service policies, and the Better Business Bureau. The price range for tungsten bands varies widely, from as little as $200 for a simple band to more than $2,000 for a detailed band with inset diamonds. Online dealers frequently offer sales, however, so couples should take the time to compare prices if they need to watch their budget. Because of the difficulty with resizing and repairing tungsten rings, merchants typically offer generous lifetime warranties that include those services as well as polishing and other maintenance. Depending on the type of ring, shipping costs and a deductible may be charged (usually higher if gemstones or intricate detailing is involved), and most warranties are voided if the ring is altered in any way, such as independent resizing or engraving. Though tungsten is incredibly durable, it is still wise to remove the ring when engaging in heavy activities, particularly ones that involve any chance of the ring being hit such as carpentry or construction. The rings can be cleaned with mild cleansers and soft cloths, and should be stored separately from other jewelry, particularly diamonds, which can still scratch the metal. If the tungsten ring includes diamonds, couples should take all the necessary precautions for caring for the stone as well. Strong, durable, and distinctive, tungsten wedding rings are rapidly gaining popularity as sophisticated men's wedding rings. With a wide variety of styles available to suit any budget, any husband-to-be will be able to find the perfect ring to symbolize his new marital status.